RobiCon.org compliant (Molex MicroBlade) connector, 4-pin. 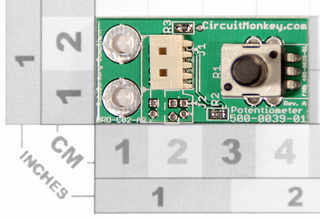 Height and Width varies with potentiometer part used. "Add interactivity to any project!" Potentiometer board based on the Bourns PTV09 potentiometer. The PTV09 Potentiometer provides convenient analog rotation measurement or setting for a wide variety of applications. 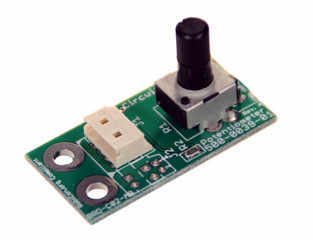 The signals on the potentiometer board are connected using Molex 53015 (MicroBlade) series for reliable and vibration resistant connections. These connectors are RobiCon.org compliant (an open-source interconnect standard that we are proposing). 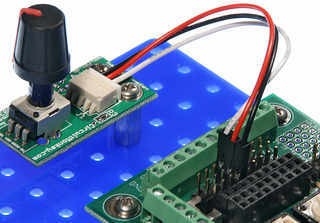 The board is 40mm x 20mm and features two mounting holes placed 10mm apart at one end of the board. The holes are plated and connected to logic ground and accept screws of size M3 or less ( M3, 6-32, M2.5, 4-40, etc. ).